WELLESLEY, Mass. – The upset was there for the taking. 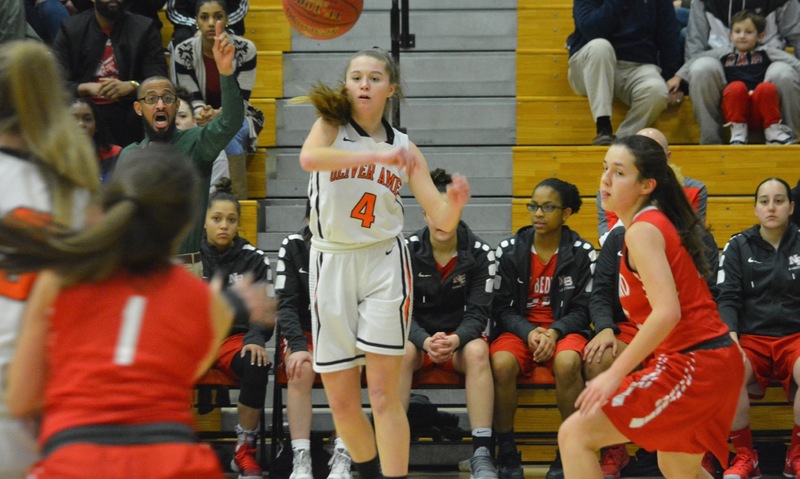 Oliver Ames was down by just one point entering the fourth quarter on the road at second-seeded Wellesley in Friday night’s Div. 1 South quarterfinal and battled back from seven points down in the fourth to get within three twice, but the Tigers couldn’t find the baskets they needed against the experienced Raiders. 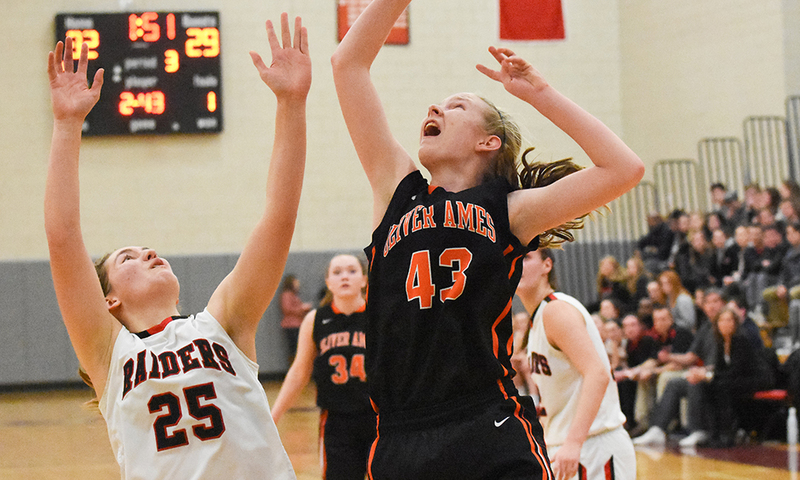 Oliver Ames (13-9) gave the hosts everything they could handle, but the Raiders showed their mettle and made the big shots when they were needed to pull out a 46-41 victory that sets up a semifinal against Bay State Conference rival Braintree. From the start, it was obvious that offense was going to be tough to come by for both teams. Despite scoring a combined 26 points in the first quarter, neither team was able to find a rhythm offensively, although Wellesley was finding some success slipping screens in the pick and roll and getting its forwards heading to the basket. OA was relying on its ability to get into the paint and out on the break to generate its offense. 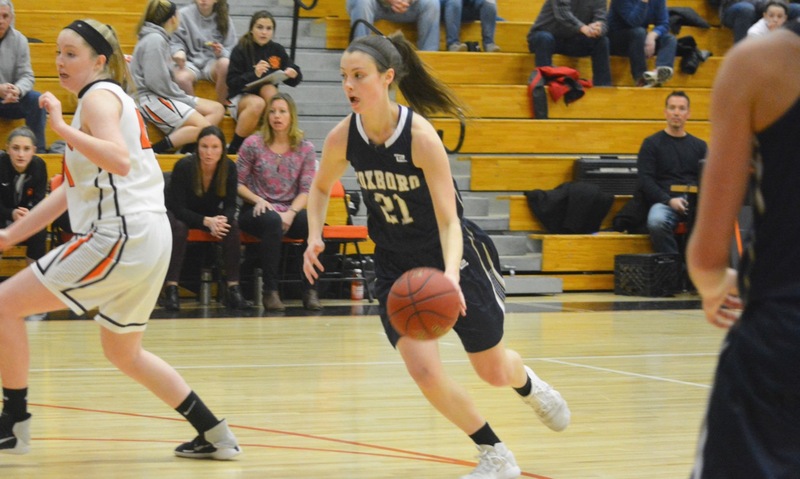 Senior forward Alex Sheldon got off to a good start with five points in the first, including three free throws, and sophomore Caroline Flynn got an offensive rebound and then scored off a Meg Holleran assist. Wellesley led 15-11 after one, but the defenses got even tougher to breakdown from that point forward. The Raiders would only make two shots and score seven points in the second quarter, but they also held OA to just one made field goal (a Flynn layup in transition) and six points to actually extend their lead to five points at the break. Senior guard Gianna Palli came out firing in the third, getting free for a rare drive to the basket and burying a deep three from the wing to push the Wellesley lead to as many as eight points. As it turned out, the basket would be her last of the night, as Sadie Homer clamped down and allowed Palli (11 points) little room to maneuver. Just when it looked like Wellesley may break the game wide open, the young Tigers came storming back. Freshman Caroline Peper, OA’s leading scorer, finally wriggled free of the attentions of Wellesley senior Molly Cronin to score on an offensive rebound plus the foul. Homer found Flynn (10 points) in transition for an easy basket and then Flynn set up Sheldon (seven points) for a short jumper. When Flynn kicked out to Holleran for an open three, OA had come all the way back to tie the game at 29-29. Wellesley responded with a big three from Cronin but Holleran set up a cutting Peper (12 points) for a basket that made it a one-point game with eight minutes remaining. In close games, when the pressure gets ratcheted up, experience counts and the Raiders definitely benefited from playing in this stage or later in recent years. Anna Glashow drilled a three and then, after a Peper basket, Lily Woodring beat the buzzer with a contested mid-range jumper following a great defensive possession. Brooke Guiffre (game-high 14 points) hit a three from the corner to put the Raiders back up seven. Peper had been largely held in check by Cronin’s defense, but she got fouled on a three-point attempt and made all three at the line to get the game back within four. Clement-Holbrook saw this game as a learning experience for the rookie on how to handle this level of attention from opposing defenses. Trailing by five, OA had several defensive stops in a row, but each time the Tigers failed to take advantage at the other end and the clock started to whittle away. Finally, Holleran fought to grab an offensive rebound and wriggled through a few defenders for a basket that made it 41-38. Wellesley went to the line but missed a pair only to have Goehringer snag the rebound with 57.1 on the clock. OA again locked down on the defensive side of the ball, sticking with players through a myriad of screens on the perimeter until the ball swung over to the left wing where Guiffre made the biggest shot of the game, sticking a three despite Flynn’s hand right in her face. The game was far from over, as Homer (seven points) came down and answered with a three of her own to keep it a one-possession game with 10.2 remaining. OA fouled on the inbound and Guiffre missed the front end of the one-and-one. Flynn got the rebound and headed up court but the Tigers were called for traveling with 4.5 left. Guiffre made amends by hitting two at the line and sealing the win. NORTH EASTON, Mass. – Midway through the third quarter of Wednesday night’s game at the Nixon Gym, Franklin junior center Ali Brigham was sent to the line with a chance to reach the 1,000-point milestone. She missed the first, but drilled the second one to become the first Franklin player to hit that mark since Kelley Meredith in 2008 (Kyle Gibson reached 1,000 points in 2011 for the Franklin boys). After head coach John Leighton called a quick timeout, Brigham, who finished with a game-high 20 points and 12 rebounds, was mobbed by her teammates on the court. 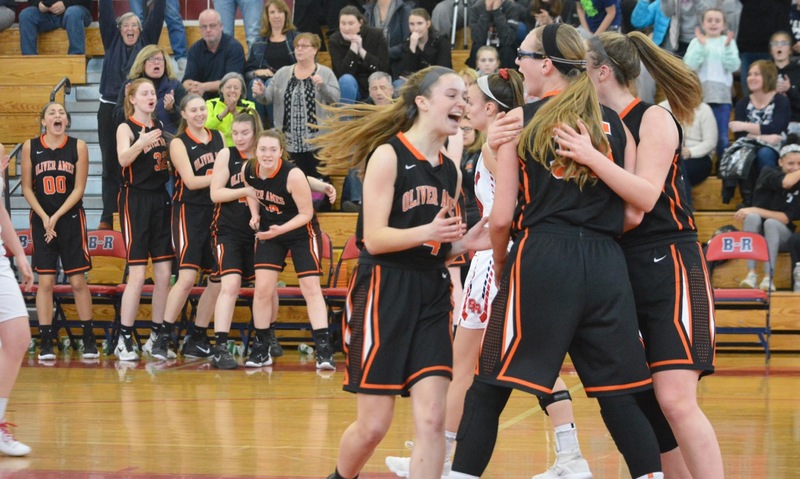 There were plenty of hugs and smiles at that stage of the game, with the Franklin ahead 33-32, but Oliver Ames nearly put an early end to the celebrations when it took a seven-point lead in the fourth quarter. With three minutes to play, the Tigers led by four and it looked like Franklin’s unbeaten run through the league was about to end. The Panthers rallied with a 13-4 run to close out the game, including 10-2 over the final three minutes, to pull out a 53-51 victory and allow Brigham the chance to savor her moment as well. Brigham has been a dominant force in the paint since her freshman year, and came into the week leading the league in scoring with more than 22 points per game. Leighton praised his star for her desire to keep improving her game. 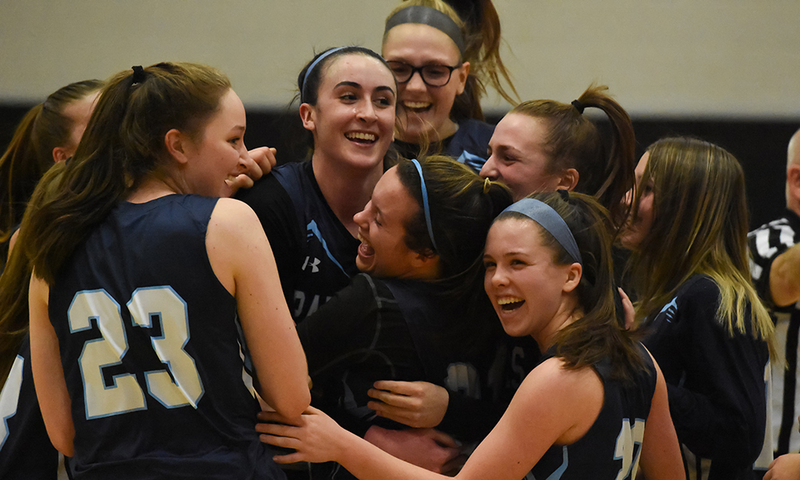 While the headlines would be about Brigham’s milestone, it was freshman Olivia Quinn and senior Bea Bondhus that would bring Franklin back in the fourth quarter. Twice Ally Scolnick (eight points) got behind the Franklin defense for transition layups, both assisted by Caroline Flynn (eight points), freshman Caroline Peper (team-high 17 points and eight rebounds) drilled a corner three, and her classmate Hailey Bourne (eight points) snagged an offensive rebound to help OA build a 47-40 lead. Quinn helped the Panthers claw back into the game by crashing the boards. She scored six of her seven points in the quarter (hitting three of Franklin’s four made field goals) and all came on offensive rebounds, including a layup that tied the game at 49-49. Bondhus (14 points) followed another defensive stop by driving down the left side of the lane, absorbing the contact, and finishing at the rim for the go-ahead score. Another defensive stand and two more free throws put the Panthers up four with only seconds remaining. 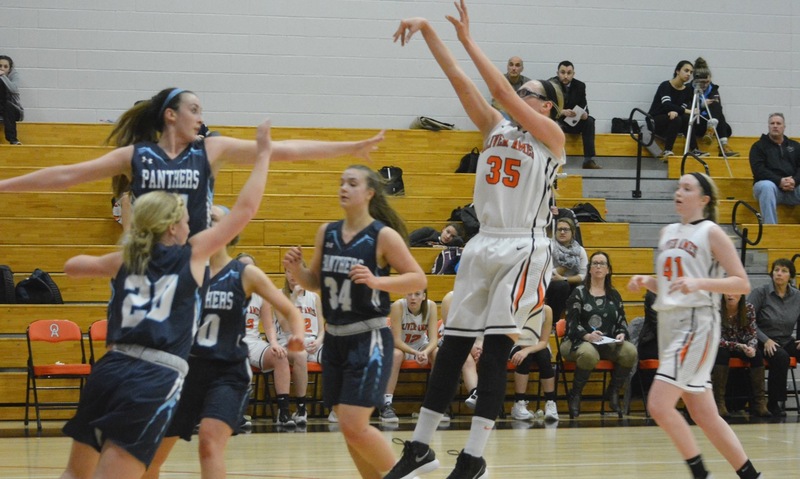 Things were a struggle at the start of the game for the Panthers, who were clearly trying to get Brigham some touches, but OA senior forward Alex Sheldon was doing everything in her power to keep Franklin’s 6-foot-3 center uncomfortable and limit her touches. Bourne, despite giving up plenty of size to the George Washington-commit, also jumped into the post to provide some defensive help. Flynn got off to a good start on the offensive end with six points in the first, twice getting transition baskets off Sadie Homer assists, but Brigham still managed to get eight in the quarter and keep the Panthers down just three, 16-13. Franklin clamped down defensively in the second, limiting the Tigers to just seven points as a team, six of those scored by Peper. On the other end, Bondhus started to heat up. She scored six in the quarter, including a steal and layup that put the visitors ahead 24-23. Shannon Gray hit a jumper to put the Panthers up three at halftime. Brigham was only three points away from 1,000 to start the third and opened the second half with a basket, but Peper countered with a bucket, assisted on a Meg Holleran basket, and then drilled a three to tie the game at 32-32. Megan O’Connell was taking advantage of the attention being on Brigham to score six of her nine points in the quarter. After Brigham hit her free throw to reach the milestone, Scolnick got her first points to tie the game at 34-34. Bourne went 4-of-4 at the line and the teams entered the fourth quarter tied. 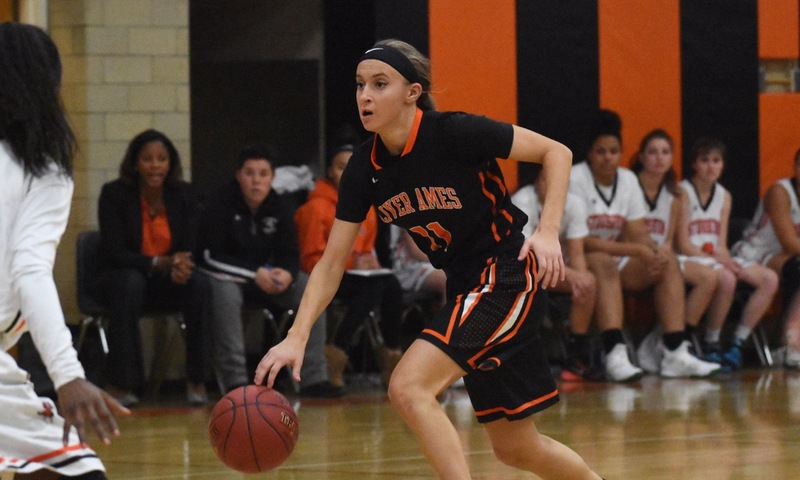 OA opened the fourth with a 9-2 run and looked on the verge of a signature win, but the Panthers showed why they have only lost once this season and were able to earn the come from behind win. 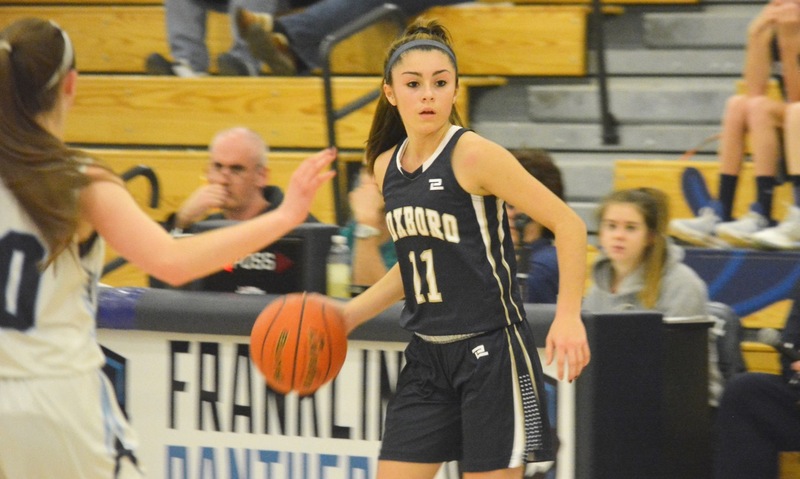 Franklin (17-1, 15-0) will close out league play against Attleboro on Friday before taking on perennial power Braintree (and either Belmont or Cathedral in the second game) at the IAABO Board 27 Tournament at Woburn High over the weekend. Oliver Ames (10-7, 9-6) will end its league schedule by hosting King Philip. NORTH EASTON, Mass. – Trailing 50-49, Sydney Gallery knocked down a free throw to even the score with 3:46 left on the clock. 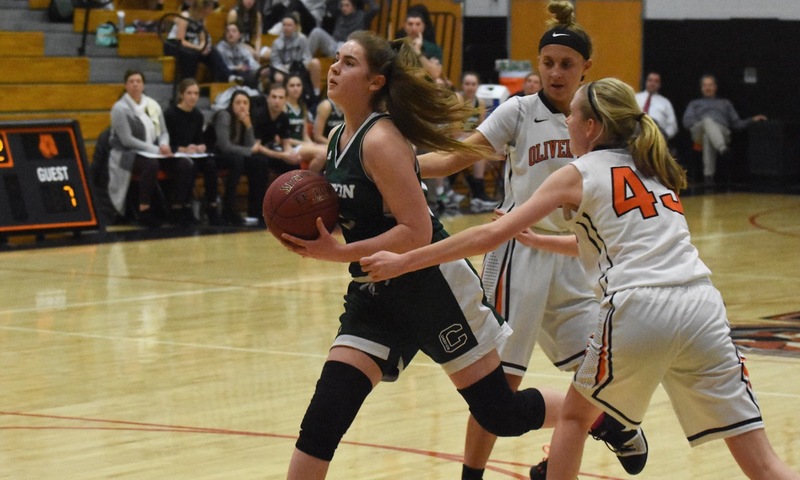 It turned out to be the start of a 12-0 run that allowed Canton to open up Tuesday night’s game against Oliver Ames at the Nixon Gym and earn the Bulldogs a rare win in this series. Canton closed the game with a 16-6 run over the final four minutes and shot 15-of-18 at the free throw line in the fourth quarter to seal a 65-56 victory and move one win from a quick return to the state tournament. 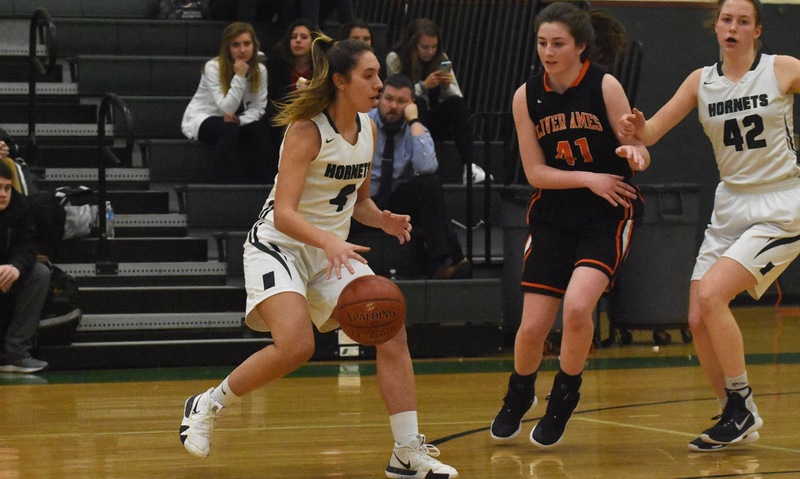 Freshman Kiara Cerruti scored 10 of her game-high 20 points in the fourth and personally went 8-for-8 from the line down the stretch, while playing strong defense on OA’s rookie leading scorer Caroline Peper (11 points). The game was close throughout, with neither team building more than a five-point lead until late in the fourth quarter. Fay Gallery (16 points and six rebounds) and Julia Hamilton (six points and six steals) each hit threes to get things started for Canton in the first quarter. Peper nailed one of her own to tie the game at 9-9 but Canton scored five straight until a layup from Alex Sheldon (11 points, 13 rebounds). Kayla Albert scored her only basket on a rebound to make it 16-11 after one. OA turned things around in the second. Ally Scolnick (game-high 15 points) scored six in the quarter and Hailey Bourne twice got to the basket for layups. Cerruti nailed a three in the final seconds of the second to close the gap to one, 28-27, at the break. The back-and-forth nature of the game continued in the third. Fay Gallery drove to the basket for two and then buried a three to put Canton up four. Bourne and Sheldon got back-to-back baskets to tie the game. Maggie Connolly scored six of her 12 points (she also pulled down 12 rebounds) in the quarter but was matched by Scolnick, who drilled a pair of threes. Sydney Gallery (seven points) scored at the buzzer to put the Bulldogs ahead 43-42 going into the final eight minutes. After a pair of Connolly free throws, Caroline Flynn (nine points) gathered an offensive rebound and scored to cut the lead to one. More free throws for both teams gave Canton a lead but Peper scored and then Sheldon got her final points of the night to put the Tigers ahead 50-49. Sydney Gallery tied the game with a clutch free throw and then her twin sister put the Bulldogs ahead to stay, draining a three off a Connolly assist. Cerruti followed with a drive to the basket and a lefty, scooped finish off glass. The Tigers tried to get back into it with a three by Teper and a three-point play by Scolnick but the Bulldogs shot 10-of-12 from the line to hold on. While neither coach could remember exactly when Canton had last beaten OA, Clement-Holbrook could only say it had been a long time. Choquette admitted that the lack of experience of his talented freshman may have been an advantage because they weren’t worried about the history between the two teams. Canton (9-4, 7-4) will try to clinch a playoff spot and move within a game of the Davenport title when it hosts Foxboro on Friday. Oliver Ames (8-5, 7-4) will look to bounce back against Taunton.